Loss and grief are universal human experiences, and can have serious and far-reaching personal and social consequences; however, some research suggests that the negative effects of grief can be managed through supportive communication. Recent studies in loss and grief facilitation, education and counseling, have shown that, although children and teens can be confronted with loss and grief issues on an almost daily basis - via events on a personal level or within their milieu, or global happenings - not much has progressed in the areas of awareness, sensitivity, and education, on the part of teachers and other staff in schools, to address these. This book undertakes to provide an overview of studies that discuss the different types of loss and grief education, and modes of expression, which, when applied in a school setting, have had a profound effect on deterring students from school absenteeism, substance abuse, gang affiliation, suicidal thoughts, and the like. The conclusion is that there are three main conceptual streams in this literature. The first stream identifies differences in processing loss and grief issues in children, and teens, and why these differences are significant. The second stream reports on how teachers can be educated on loss and grief issues, vis-à-vis, how to approach the subject of death with students. Finally, the third stream proposes how the creative art therapies – drama, film, music, poetry and art - can be successfully incorporated in schools, when addressing loss and grief issues. 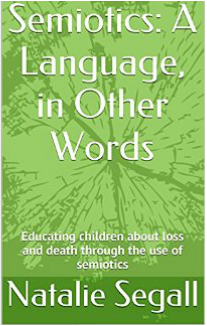 In this article, it is the author’s intention to point out what she sees as central issues when considering how semiotics (the study of signs and symbols and their use or interpretation) can be used to teach children about loss and death. She has included examples of how loss and death education can be taught using the expressive art therapies as symbolic outlets for intense emotions. Furthermore, she has called attention to the many important links between semiotics, medicine, and the expressive arts. She has then underscored how these links can be employed by educators trying to teach children about loss, death and grief. This article also elaborates the way in which meaning is produced in society, along with the process of signification and communication. When a school and/or community, society teaches children about loss, death and grief at an early age, using age appropriate language, we instill in them a sense of respect for life. We also impart to them a non-judgmental understanding of individual differences, customs, traditions and rituals. Educators have the ability - and responsibility - to provide children with a safe place for them to express overwhelming emotions, at what may be an extremely tumultuous time in their young lives. By teaching children about loss and death, we also impart to them, sound and invaluable coping skills which will serve them well in the future.